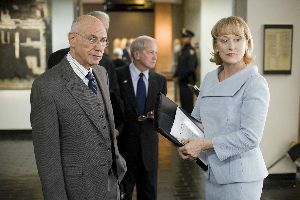 Cast: Reese Witherspoon, Jake Gyllenhaal, Meryl Streep, Peter Sarsgaard, Alan Arkin, Omar Metwally, Yigal Naor. Story: A man is tortured under the belief he's involved in terrorism. Rendition asks, "torture - necessary evil or just plain evil?" It's far from torturous to watch, but it's fairly clear where the loyalties lie. It's not often that a movie's plot continually surprises me, but Rendition's did. Every time I thought it was going one way, it went the other, and so you'd be best advised to read as little as possible about the movie before you see it. In particular, the secondary thread of the story, featuring young forbidden lovers in the area affected by the attack, is especially satisfying if you don't already know where it's going. It's not that it's unpredictable per se - looking back on it, I could've seen it coming - I just didn't. I put that down to the director's talent in subtly leading me in the opposite direction without me noticing. As an example, shortly after the terrorist attack happens, we see a passenger plane on final approach, descending behind the big needle landmark thing, but it kinda looks like it's not going to go behind it ... and so we're subliminally reminded of 9/11. Clever. 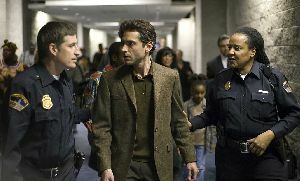 Rendition is a political thriller without the usual in-your-face message. Even if you get bored at politics (like me), you'll still find enough to interest you here - though there is nothing in the way of action for the adrenaline junkies. To enjoy this film you should be: able to stay awake without car chases. Rendition was released in the UK on 19th October 2007.